This article explains the theory of Rockefeller Habits, developed by Verne Harnish in a practical way. After reading it, you understand the core of this strategy and scale up theory. Rockefeller Habits is a business administration theory that was formulated by the American entrepreneur and business coach Verne Harnish. In his 2014 book ‘Scaling Up; Mastering the Rockefeller Habits 2.0’, he provides practical tools for entrepreneurs related to company growth. Verne Harnish came up with his theory after reading the biography of the incredibly wealthy John D. Rockefeller, who used these principles as the foundation for successful management in the late 19th and early 20th century. Harnish explains how an organisation can grow stronger by eliminating weaker elements and focusing on its strengths. The basics of the Rockefeller theory are Priority, Information, and Rhythm. These 3 points are important for a company’s growth. According to Verne Harnish, company growth doesn’t follow a straight line. It has ups and downs. Successful growth primarily has to do with timing. For instance, responding to a growing market need at exactly the right moment. In addition, the theory focuses on John D. Rockefeller‘s 10 business disciplines. Prioritising is the first foundation. It’s pretty much self-evident but has faded into the background in many companies. That’s why Harnish recommends setting five priorities for a certain period. Depending on the work and the priorities, that period can be a month, a quarter, or a year. By setting joint priorities, all employees will know what they’re working towards and why. Ensuring that everyone is on the same page and that personal goals will suit organisation-wide priorities. This will make them more involved and loyal towards the company they work for. Information is essential in any organisation. That means that information has to be gathered, managed, and distributed. Harnish makes clear that (strategic) decisions have to be made on the basis of facts, not gut feelings. By accumulating useful information beforehand, it is easier to form opinions and arguments. For instance, think of useful information on competitors, customers, new products and services, the own organisation’s performance, and the way the organisation is perceived by stakeholders. The third foundation Harnish mentions is the day’s rhythm. Every organisation benefits from rhythm, order, and regularity. An example of this are recurring meetings in which priorities, goals, useful information, and progress are discussed. Employees appreciate such frequently recurring items in their work schedule. They can rely on them and schedule their work accordingly, around the fixed moments that occur in their organisation. That way, everyone can keep the previously established priorities in mind, and call each other on deadlines that haven’t been met. Furthermore, the progress in the organisation becomes clear, making it possible to make quick and effective corrections if necessary. The management team (MT) sets the tone and inspires all employees. The MT offers useful information and keeps all departments and employees up to date regarding changes, financial results, and other news. The MT consists of a group of managers that each have a different expertise and (management) style. There’s no dissension within the MT, and they communicate with the outside world as a unified group. All employees are aligned, set the same priorities, and are working towards the same deadline. People in the organisation care about the strategic goals. Employees get satisfaction from working towards a goal and are rewarded when they achieve their target. Information is shared all the time and moves through the organisation. Team managers are expected to really listen to their employees and communicate their ideas to the upper management. Vice versa, they pass on information from upper management to their subordinates. Information has to be honest and based on facts. It has to be communicated to the relevant parties as quickly as possible. Openness is very important. Someone is responsible for achieving the set goals for each facet and each department within the organisation. This owner carefully monitors all progress and communicates with the team in a timely manner if the goal has to be adjusted. Possible issues, difficult cooperation, resistance, or unwanted behaviour are discussed openly. Employees receive feedback from each other and their supervisors and vice versa. Additionally, ideas and suggestions of employees are collected and discussed every week, and there’s an opportunity to deal with any obstacles. In addition to calling each other on certain behaviour, it’s also important that employees compliment each other. All employees help gather customer data. Additionally, customer reviews are collected, analysed and reported every week. If necessary, activities will be adjusted for the customer’s convenience. It’s important that there is frequent (weekly, for example) communication between the MT and customers. The core ideology – mission and vision – is present throughout the organisation. Everyone knows what the company stands for and communicates this to external parties. This core ideology is part of the recruiting process; new employees have to be able to identify with their employer’s mission and vision. Every employee knows what their company stands for, and what the product and market proposition is. The brand promise has been clearly defined and is known to everyone. It’s also clear what the strategic sales and marketing goals are. Key Performance Indicators (KPIs) are known to everyone in the organisation. Employees know exactly how to contribute to productivity and their individual KPIs are discussed in the team for each department every week. Every week the MT has a meeting to discuss the organisation’s (financial) progress. The KPIs for each department as well as current deadlines and goals are also discussed. The core ideology, market position, and performance are recurring topics of conversation. This part is also referred to as ‘people, strategy, execution & cash’; a different name for the Rockefeller Habits. A healthy organisation requires vision and leadership. That’s the only way to increase productivity and make profit. It also means that less popular measures are taken, and that it’s sometimes necessary to make course adjustments. Are the right people in the right positions? Is focusing on a specific target group really the right solution? Should the organisation continue to manufacture products that have been its core business for many years? Such critical questions will help to keep the MT on their toes and makes them consider how much time it will cost to earn back investments. This is where the Rockefeller Habit Checklist comes in. It’s a questionnaire based on the 10 habits, other themes, and possible bottlenecks. For instance, it can ask what the organisation could improve, what the organisation should continue to do, and what the organisation should definitely give up. This will give the MT important information with points for improvement. All these points can then be converted to themes that the employees can work on themselves. They can identify and list the bottlenecks that they want to resolve or improve within a certain period. These bottlenecks are also called rocks. Employee input is a very powerful resource to achieve improvement. Actively involving employees is step two. It generates support for the measures. Involved employees are able to work together well and look for solutions as a whole. It’s important that employees grow with the organisation and not feel that they’re lagging behind. These steps seamlessly fit with the three previously mentioned foundational elements Priority, Information, and Rhythm. 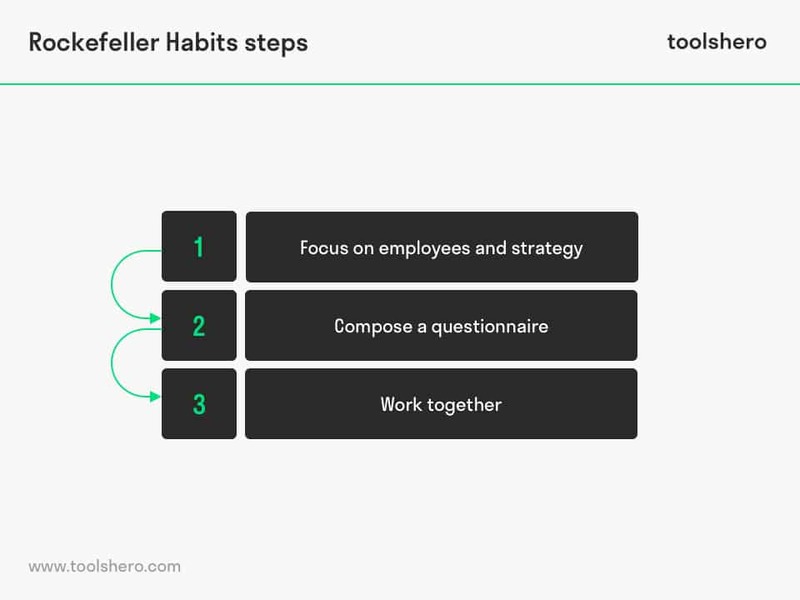 The Rockefeller Habit Checklist is a useful tool to involve all employees in the organisation and the direction it will take. Could you use this theory to benefit your business? Do you recognize the practical explanation or do your have any additions? Do you have any tips or tricks that you want to share about scale up strategy and execution? Chernow, R. (2007). Titan: The Life of John D. Rockefeller. Sr. Vintage. Harnish, V. (2014). Scaling Up: How a Few Companies Make It… and Why the Rest Don’t (Rockefeller Habits 2.0). Gazelles Inc.
Harnish, V. (2002). Mastering the Rockefeller habits: What you must do to increase the value of your growing firm. Gazelles Incorporated.